SLH organised a gin tasting evening to raise money for Growing Well, a local charity who work with people who are in recovery from mental health. The event took advantage of the growing popularity of gin and managed to raise money through selling tickets to the event and also holding a raffle on the night with prizes donated from people attending the event as well as local businesses. 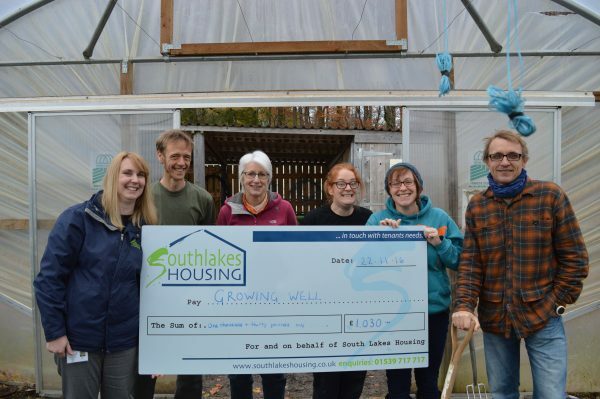 General Manager at Growing Well, Clairelouise Chapman expressed grateful thanks on behalf of the charity, saying “we were delighted to accept South Lakes Housing’s offer to hold a fundraising event on behalf of Growing Well. One in 4 people in the UK will experience a mental health problem in any given year so the work we do, specifically focusing on helping local people in their recovery from mental health, is vital. Part of the work we do with volunteers is to help them prepare for a return to the workplace so to receive such a generous donation from South Lakes Housing is wonderful as it will allow us to buy essential resources including restocking our library with materials used by our volunteers to help support their recovery and progression”. Emma Perie, Senior Project Manager at SLH, said “It is nice to be able to organise an event which makes a huge difference to a local charity and the response to ticket sales was more than we ever imagined and we will look to organise further events in the future”. Growing Well is an award winning Kendal based charity established in 2004 which supports people in their recovery from mental ill health. Our core mission is to work with people experiencing mental health problems, many of whom are experiencing profound distress and chaotic lives. We believe that by engaging these people on our 6 acre farm, and asking them to help us run our charitable business, we give meaning to activity, create a sense of purpose and support paths to progression to the workplace, training or volunteering. We engage with those teams within the National Health Service which support people experiencing mental ill health. These include GP’s, Mental Health Teams and specialist support units (for example Drug and Alcohol misuse) We encourage referrals from these organisations to our organic horticultural site. We currently deliver 3000 volunteer days per annum, and are looking to extend this to 5000 over the next three years. In addition we deliver a Therapeutic Community one day each week, working with people experiencing Personality Disorder, and work with local primary schools offering a Wellbeing Programme aimed at building emotional resilience in young people.